IFI XCan- ICAN, UCAN, WE ALLCAN! *Head pie editor note: Any formatting problems was caused by me. Cons – Some connectivity issues. I will admit this. It was almost by sheer dumb luck that I found out about the xCAN. Perusing the Head-Fi site after some time away (classes/family obligations, you know…) I found the advert on page one. I was interested because I had heard the rumblings of such a critter for some time. 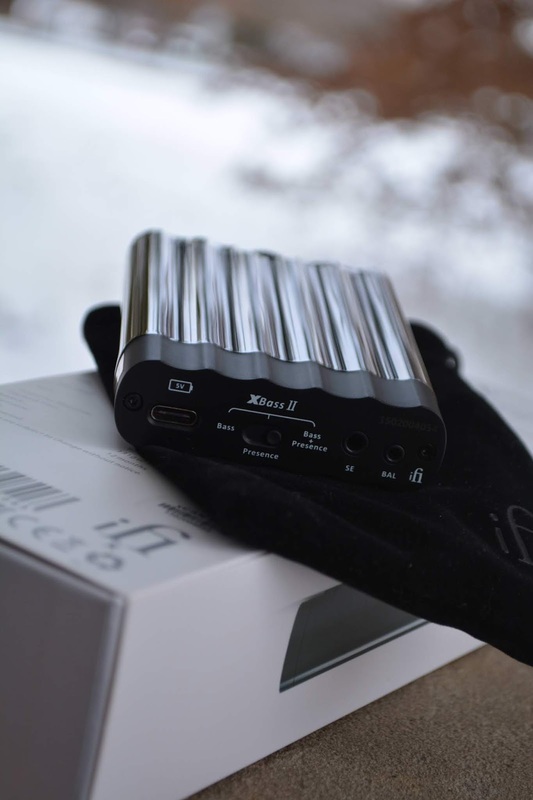 And I own the iFi xDSD as well, which is a regular in my rotation. I like the xDSD quite a bit, as I do the iFi Micro iDSD Black Label. The latter is part of a stack combination, which includes the xDAC2 and iTubes2 as my go to home set up. The xDSD is eminently portable and as such travels with me often. One aspect of which there is a bit of negative rumble surrounding the xDSD is that it lacks the true power to drive those harder-to-drive headphones to their full potential. As I do not own one of those legendary harder to drive headphones, iCANNOT honestly say yes or no to this. What iCAN say to this (see how iDID that?…) it that no matter what IEM/headphone I used with the xDSD, it just worked. I had plenty of volume (only part of the listening story); and it produced a full rich sound worthy of being included with more expensive DAC/AMPS. As I stated, it is still in my rotation when I need a portable amp. So, after reading the thread (which at the time was still developing) I heartily threw my hat into the ring. I contacted Lawrance, and he provided me the current xCAN, which resides in the pictures within. Service was fast (as always with iFi), the item came well protected and two short days later, I did the unboxing pictures. A benefit of having such an animal in house was that I could throw it into the chain while doing other reviews and get more impressions than I might otherwise. A nice benefit, and the use of which can be garnered across some of the current “hot” IEM’s. So, it is a win-win. 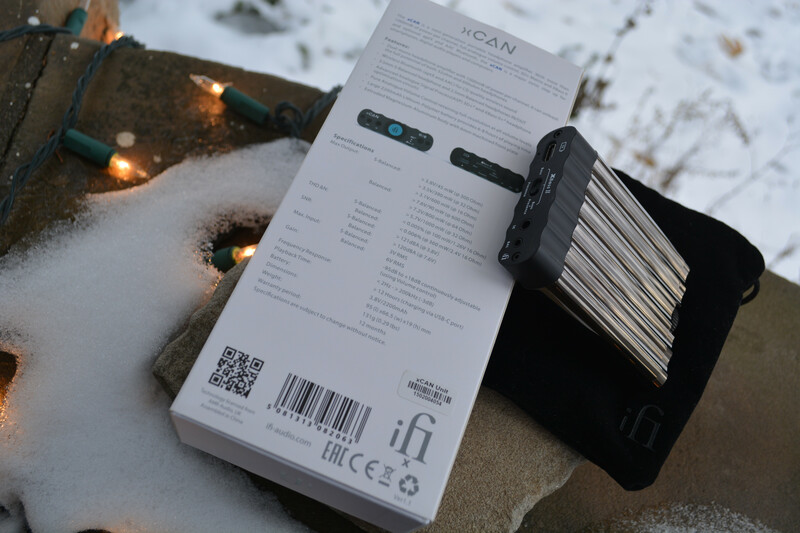 I thank Lawrance and iFi for the chance to review the xCAN. All they ask is that I am open, honest and address them with any issues I might have, first. The last part is from my standpoint, as I do not want to erroneously post a problem, which may be the result of my utter clobbishness. Witnessed by my misinterpretation of the back functions of Presence/Bass (read the thread for the clarification). *ONLY found in iFi components such as nDSD BL. Do NOT feed using normal TRRS Balanced output sources. The new twenty one pilots album, Trench-get it, listen to it, repeat step 2. Coming in the familiar long rectangular white iFi box one has come to expect, there was an immediate familiarity to the xCAN. It is even the same size as the xDSD, so that makes printing and shipping easy. Included are the xCAN, a black velour carrying pouch, a micro-USB cable for charging, two (2) cables with which to hook up (one 3.5mm single-end, one 2.5mm balanced), plus the ubiquitous iFi “cheat sheet.” I have come to appreciate the sturdier paper upon which the instructions are printed as you will often look at the sheet when needing help. A business card completes the repertoire, fulfilling a simple usable box, which could have been pared down a bit more due to the size of the xCAN. With plenty of information on the outside of the box, you are not lacking in iFi information. The xCAN carries on the iFi tradition of a chrome finish with a black “tail-end.” I am glad there is that black back side, so one can grab on to it, when cleaning. I get the appeal of the chrome finish, but I would prefer another color option. I stated as much in my xDSD review and do so again here…give at least one more color option. With rounded humps, the xCAN does take on the effect of row crops in an organic garden. Tasteful and different. 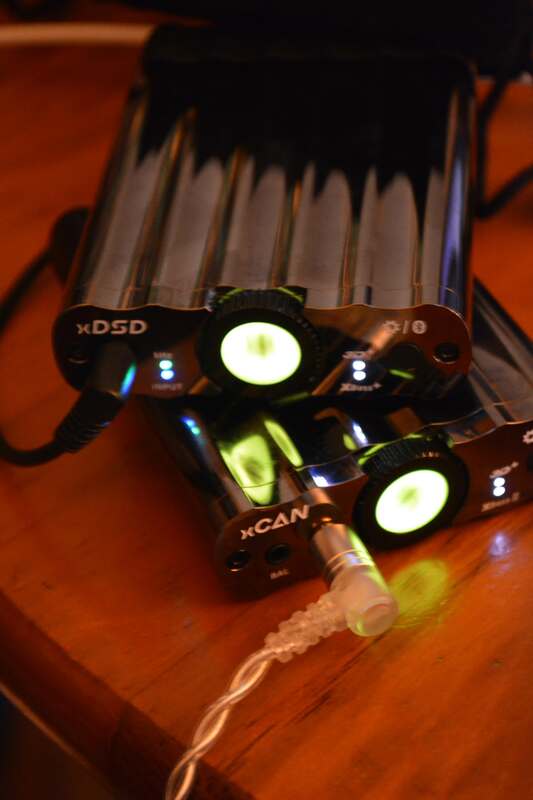 The xCAN also stacks quite nicely with the xDSD. One main “button” dominates the front; the power/source lighted button. Hold for two seconds, and the critter turns on. Hold longer (3-4 seconds) and you can change how the xCAN sources info (from BT or wired source). The familiar push button toggles you through the XBass+ or 3d+ functions. On the back there are jacks for 3.5mm SE in, 2.5mm BAL in, and USB-C charging cord. There is also XBass II, which can add “presence” to the lower-mid region as a correction much the way the XBass+ switch does to the lower-bass. You can add more bass to the lower-mids, more presence, or to both bass + presence. A nice feature for those who want a quick EQ solution. The xCAN is put together well and shows the care and commitment iFi shows in their portable equipment. Typical iFi ingenuity. Typical iFi quality. Typical iFi functionality. Hooking easily to the Shanling M3s either through BT or wired, the xCAN brought that needed juice to the M3s, which may have been missing. Power is nice, but uncontrolled power is ridiculous. You need not worry. The xCAN added to the wonderful tonality of the M3s nicely. With the added bass of XBass+ through the EN 700 Pro, you get a very nice rumble. Almost shaking in sound, twenty one pilots Levitate works through the drum/bass reverb sound well, making you feel that added bass. Through the CA Atlas, the sensation is even higher. Much higher. Staying with the affordable trip though, you have a very fine functioning system that is portable and all for less than $600. Many here spend that alone on a DAP or IEM, so immediately you have good value. 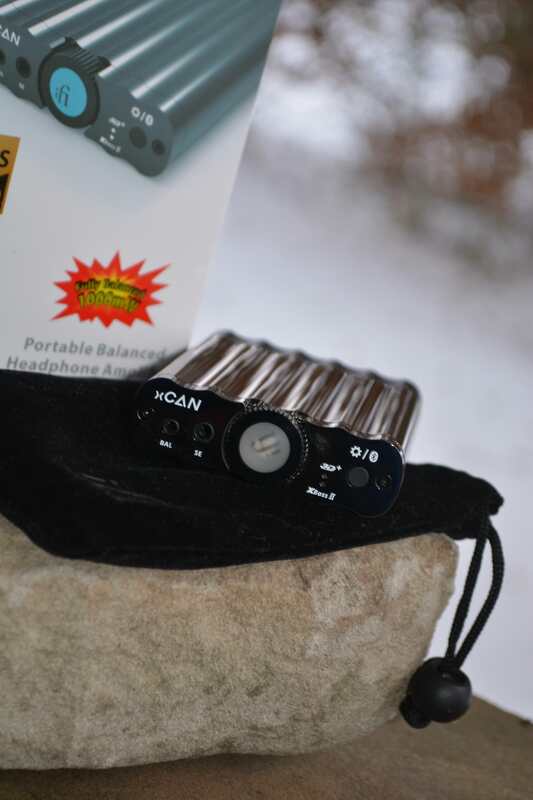 Plus, as mentioned the xCAN scales well, so you can keep it after upgrading IEM’s or headphones. Providing a bit more depth of sound than the M3s solo, you get a nice 3D presentation, especially when you have the 3D+ toggled on. Well, of course you would! But, that depth of sound is there with the 3D+ toggled off. There is an almost cross-frequency sound, much like imaging would be with both XBass+ and 3D+ turned off. Add both in (my preference), and you get that extra lower floor, while providing an unencumbered view of the stars. Running the MBP/xCAN combo through Pine Player and the CA Atlas provides the kind of full, rich sound that one expects from floor standing speakers properly placed within your listening room. This is just a fabulously deep rumble emanating from the trio. Jumpsuit through the Atlas is pretty darn fine on its own. Through in the xCAN for that added presence and bass push, and no one should complain. At all. I write this as Winter Storm Bruce shows its full wrath on our little hamlet in the heartland. This trio right here would be sufficient for guiding you through Bruce. Powerful enough to separate the wind and snow, and with enough rumble to fight back against the bass. If that is too much bass, turn it off. Plenty of floor shaking going on in my ears. A true benefit of an addition to your system answers the question, “Can that additional critter add to or enhance what I have on hand?” Simply running the BT through the MBP answers that question. Switching quickly to the BGVP DMG (review coming), the sensation while decreased, yields the same result. Nice booming bass and holographic quality sound. With the ability to quickly tailor the sound (faster than changing EQ settings), the xCAN holds its place in my system. With a better amp section than the xDSD, the added power is appreciated. In typical iFi fashion, they produced an excellent critter first in the xDSD. Then followed it by incorporating more power, with slightly newer technology in the xCAN. Much like my current iFi stack, which contains the iTubes2, iDAC2, and aforementioned Black Label, iFi is producing products, which dovetail together nicely. You really do not need both the xDSD and xCAN, but it is nice to see that they work and play well together if needed. And yes, I use my iFi stack all together the majority of the time. Throw the xDSD into the mix utilizing BT, and you have an excellent combination of better DAC and better AMP than the MBP can provide. With the added benefit of being able to control volume on all three, as well as XBass+ and 3D+ on both iFi units, and you can almost imagine yourself as a personal DJ. Your ears do approve. Battery life has been improved a bit on the xCAN as well. My first go around, I achieved about 8 hours of solid listening. After that continuous test, I was able to consistently get about 5-7 hours, which I attributed to all of the switching done between BT/wired/IEM/headphone/etc. Not bad indeed. Nothing of note really, except for some who are “concerned” with the chrome finish attracting fingerprints. It will happen. It will happen often. You will give up. You will ignore the prints and focus upon the sound. You need to let go of that “concern” for the fingerprints of the world, for they want you to listen. Throw on Morph from Trench, plug in your favorite IEM, turn the volume up, sit back and watch the blizzard go by, err time. Sorry, we are in the midst of Bruce as stated. Beautiful, and powerful all the same. Kind of like the xCAN. iFi seems to do this on a regular basis. OK, another small niggle…there is some short-term connectivity problem when switching between wired/BT. I had that with the xDSD, and still have it. Many times, you can simply switch between the two platforms. Sometimes it will not recognize the BT pairing. So, forget the xCAN on your source, and reconnect. This seems to be only on a few select source devices, so I would not worry too much, or consider it a deal breaker (NO WAY!!!). So…what are we left with? Pretty much a steal if you must boil it down to one word. More versatile than my iBasso PB3 (another balanced in/balanced out amp), and with more features. I have not really talked about the balanced in/out feature as many will not use the critter that way. But if you insist…It worked. Balanced in/out worked the way one would expect. 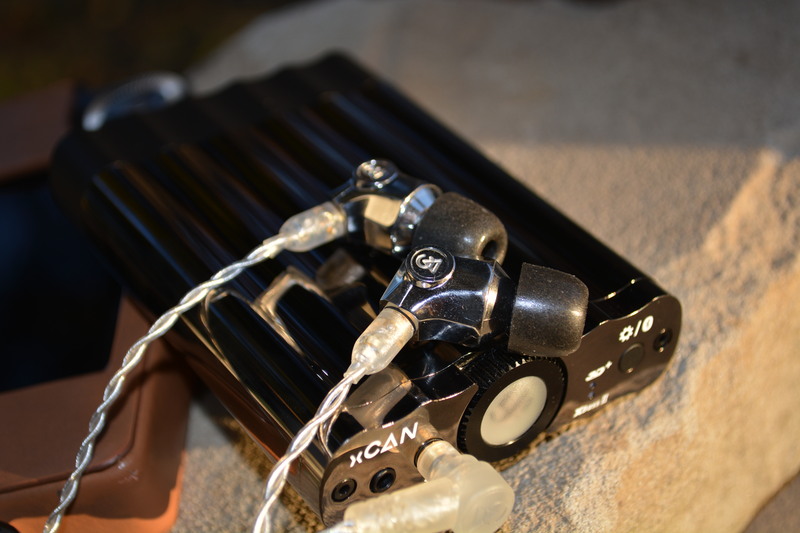 Shove a balanced source-out sound into the balanced-in of the xCAN and you can comfortably play your balanced headphones in the bal-out port on the front of the xCAN. No muss, no problem. You can even simply hook up your balanced headphones to the front, and the magic involved inside will automatically convert the sound to balanced. What voodoo is this??!! Holy smokes! Good stuff, indeed. So, short of the chrome (meh) and sometimes-connectivity issues, there really is not much to warrant criticism here. Someone mentioned in another review that the xCAN will default to XBass+ on when you turn it back on. That simply is not the case for the one I have. I will not debate whether that person left the XBass+ on or not, obviously if they reported it, then it did happen. The XBass+/3D+ should default to the last setting if it is a short-term turning off (I just tried it). I have noticed that after being off for a day or so, the xCAN will revert to neutral (both off), so YMMV. Either way, another minor niggle in the world of chrome-goodness. 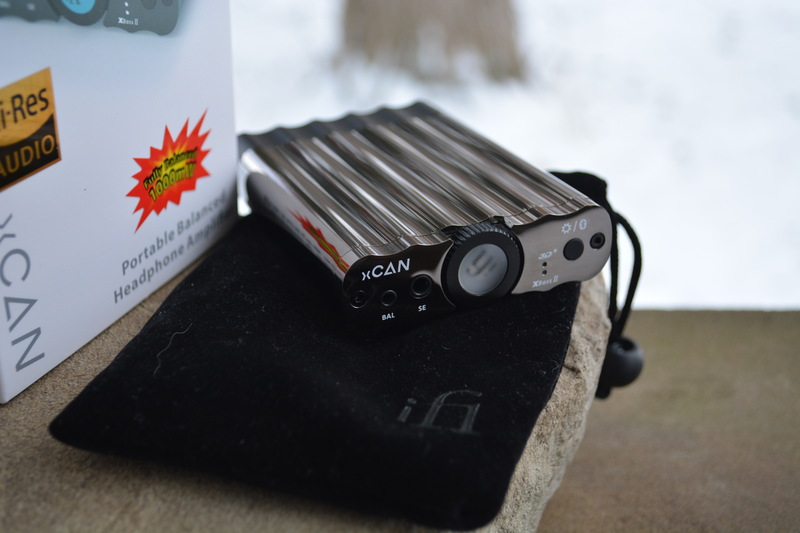 The iFi xCAN is a very, very good portable amp, which ticks many of the boxes people want. It is portable, small, powerful, adaptable, ability to use both SE and BAL, and sounds good. It works, it sounds good (not quite the DAC standard as the xDSD but it isn’t supposed to…) and can be hooked to pretty much anything you have in a matter of moments. There isn’t a whole lot to dislike. You should give this fine critter a long listen if you happen to be in the market for a portable SE/BAL amp. Special thanks to Lawrance and iFi for the continued faith, this is a good unit, which deserves the attention it is getting currently. Put on Bandito from Trenches and enjoy the sound. It will be worth it. Hey guys I thought I would share some feedback from the Beijing Show. I have spend a couple of hours and had the opportunity to try a lot of new stuff, mostly out of my Lotoo Paw Gold 2017. Unique Melody: their new 3D printed Titanium stuff looks nice. The Mirage, which includes their new open BA technology, sounds super smooth, if that is what out like. The Maven is more of a classic but high performance BA. I prefer it over the Mason V3. Campfire : I gave the Solaris another go, and these deserve the hype. They are one of the best alrounders I have heard at any price if you like a fun well balanced sound with excellent technicalities. The things that keeps me from buying a pair is that I find them large and not too pretty...despite that they remain comfortable and are super well built. Dita had the Project 71 on demo. The attached cable, which will be sold separately is awesome. Flexible, not tangly, pretty, and with switchable jacks. The cable is called project Oslo. The Project 71 IEMs are small, comfortable, and have one of best build and finish I have seen on an IEM. In terms of sound, they approach perfection...if you like warm and intimate sound. I would have bought them in a second with a touch more air or less warmth. JVC : I did a second round of trials on the JVC stuff. The FW10000 is very nice but something is missing for me...not dynamic enough...certainly good for smooth jazz. The FD01 is definitely too bright even though it performs very well. FAudio : Their single dynamic, the Major is certainly one of the best tuned dynamics out there, but at the 1.5k or so price, it fails to impress me. I also tried two prototypes, X and Y. The X is a nice sounding 9 BA. The Y is maybe the best thing I listened to at the whole show. It is a BA-dynamic-electrostat tweeter, like the Trinity of the Khan, and it sounds lovely. Engaging, with awesome yet controlled bass, full mids, great imaging. I can't wait for it to get out. Jomo: I tried the Trinity to compare to Faudio project Y. I had to use the Lotoo Paw Touch in balanced mode because they had only a 4.4 at that moment, but I put my music on it. It sounds nice but didn't bluff me. I clearly liked the Y prototype from Faudio significantly more. Acoustune : I tried the 1670SS. The build is nice but the finish is not as high end as I expected from pictures. It sounds nice and clear, a good dynamic, but nothing to write home about either. Also, I think it would be uncomfortable for me in the long run. My winners, in this order : Faudio Y prototype, Solaris and Dita 71 (if you like warm tuning).